Codemasters’ F1 2014 is coming out on October 17th. And fans are angry. And they’re angry because…the version shown in the trailer looks like just a 2014 season update for F1 2013? They may have cut back features such as Classic Content? The next-gen version of the game isn’t coming out until early 2015? No, no, and no. 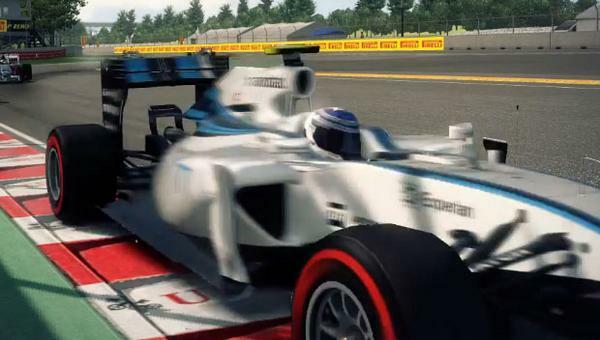 Take a look at these in-game screenshots of the Williams Martini Racing FW36. Notice anything missing? Like the logos of their primary sponsor Martini? Or even the small bits of red running down the Martini “stripes” on the rear wing and engine cover? The news that Spanish Red Bull junior driver Carlos Sainz Jr., the son of the legendary former World Rally Champion of the same name, could be brought into Formula 1 via the Caterham F1 team as early as sometime later in 2014, is one of the early talking points of an F1 Silly Season that has yet to really take shape, at least not until we get to the mid-season summer break in-between the Hungarian and Belgian Formula One Grands Prix. A mid-2014 promotion to Caterham for the 19-year-old Sainz would replicate the Formula 1 arrival of Daniel Ricciardo, whose first drive did not come with Red Bull’s “junior squad” Scuderia Toro Rosso, but with bottom-ranked Hispania Racing Team, where he participated in the final 11 of 19 rounds of the 2011 season with the backmarker organization. There, without any real pressure to score points right off the bat, he had a capable benchmark in another former Red Bull junior driver, Vitantonio Liuzzi (save for the Indian GP where Narain Karthikeyan was subbed in for Liuzzi), and Ricciardo performed admirably given the experience gap between himself, a rookie fresh out of Formula Renault 3.5 Series, and the tandem of veteran drivers who had made their F1 debuts six years earlier. Sainz would be in a similar predicament, as the Caterham team and their CT05 chassis ranks dead last among all eleven Formula 1 teams in terms of raw pace, and they are unlikely to score their first championship points this year unless there is a repeat of the attrition-packed Monaco Grand Prix from this May. In an interesting tie-in to the Ricciardo scenario from three years ago, Caterham was just sold before the British Grand Prix to a consortium of businessmen that included Colin Kolles, who ran HRT back in 2011.